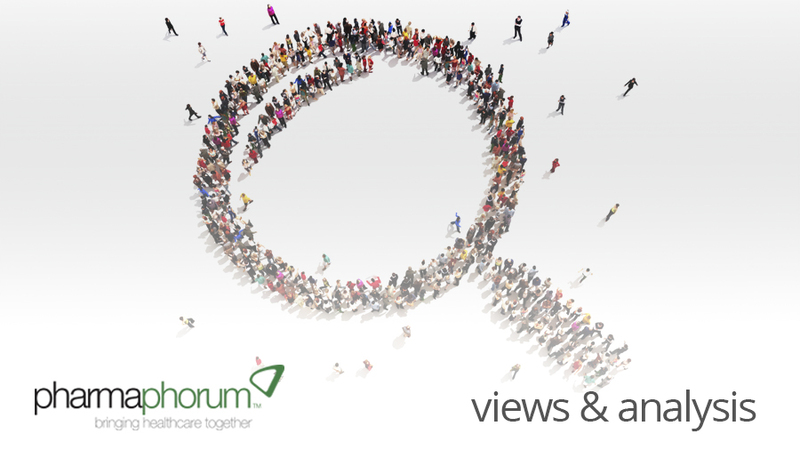 pharmaphorum interviews Professor Robert Istepanian on his inspiration for coining the terms ‘mHealth’ and ‘4G health’ and how mHealth continues to evolve. In 2003 the term ‘mHealth’ was first coined by Professor Robert Istepanian of London’s Kingston University and defined as ‘emerging mobile communications and network technologies for healthcare’. The term since then evolved massively and is widely used today and, as technologies evolve, mHealth is evolving into 4G health. We interview Professor Robert Istepanian on what inspired him to coin these terms, their exact definition and where he thinks mHealth will head in the future, given the continuous momentum of technological advances in telecoms and healthcare innovations. RA: Professor Istepanian thank you for agreeing to take part in this interview. Could you start by explaining your background and your current focus please? RI: My background is in electronic and electrical engineering, and my interest in this area goes back to the early 1990’s when I started doing my PhD in underwater biotelemetry under the supervision of Profession Bryan Woodward at Loughborough University, UK. Underwater biotelemetry is how you send relevant human / diver physiological parameters like breathing rate and heart rate in underwater environments using acoustic channels. It evolved further from the work that Professor Woodward and I collaborated on in the mid-1990’s to probably one of the first EPSRC funded projects on wireless telemedicine. At that time I didn’t think about the term mHealth. RA: What inspired you to coin the term mHealth? RI: The inspiration came from my research since the early 1990’s while conducting my PhD work at Loughborough, putting ECG sensors on divers and sending data wirelessly underwater, at that time using acoustic channels. In the mid-1990’s when the early mobile phone developments came in, I thought it’s better to move from underwater to the air. My first research in mid-1990’s was how we send electrocardiogram signals on GSM mobile phones. At that time I used the term wireless telemedicine. The inspiration then came and I linked the word mobile with the term phone, and healthcare, and this is where the whole new terminology came from. RA: What is your definition of mHealth? RI: The first definition that came into literature was in 2003 at a conference presentation on the IEEE EMBS conference, where I first introduced and coined the term mHealth. In 2004, I wrote an editorial in the journal IEEE Transaction Information Technology in Biomedicine, where I defined it as ‘emerging mobile communication network and sensor technology for healthcare systems and applications’. This was the fundamental definition of mHealth, and is the first and is currently widely used definition. mHealth is not just another app, it’s a whole complete domain of ICT for healthcare and how we really look at the future of healthcare and innovation. It will probably be one of the fastest moving research areas in terms of academic research in the next five to six years, because it’s going to bring a number of multidisciplinary domain together. RA: What recent technological advances have allowed progress in mHealth? RI: The main technological advances are the telecommunication advances from the early 1990’s until now, also compounded with the advances in the internet. More recently, new development of medical sensor technologies have also had an impact. They are advancing at a fast pace but not as fast as the wireless and the computing domains are moving, and the internet connectivity is also evolving. RA: What ICT trends have you noticed this year? RI: The key things are the movement in social networking for healthcare, machine-to-machine communications and the introduction of HDML5 and web3. Genomically enabled digital health and Cloud computing will also have a major impact on mHealth in the future. 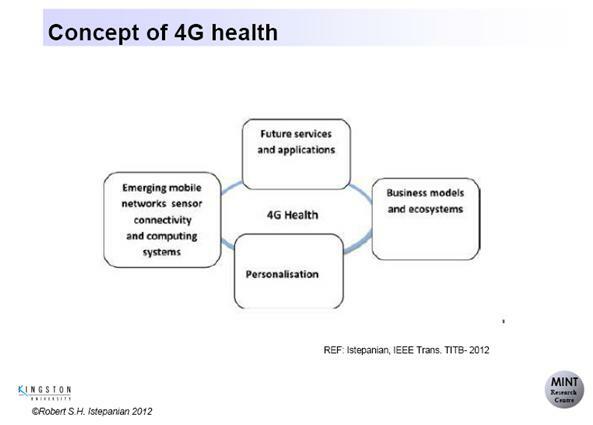 RA: What is meant by the term 4G health? This really is the evolution of mHealth. If you put it in a diagram the initial definition of mHealth contains three elements – telecommunications, internet and sensor technologies. • The future services and mHealth applications. • Emerging mobile networks, sensor connectivity and computing systems. • The business models and ecosystem for mHealth. • The personalisation of mHealth. So bringing these together is what I defined as the term 4G health. I would like to emphasise that mHealth is now the fourth pillar or domain of the whole ‘ICT for healthcare’. The most widely defined four pillars or domains are telemedicine, which started in the 20th century, and then telehealth with advances in computer systems in the 1970’s. Then the term e-health, which came in the beginning of the 2000’s with advances in computing technologies. Then finally the fourth pillar of the domain is mHealth which started in 2003 with my definition. These are the four major domains of ICT for healthcare. RA: What major mHealth business applications have you noted that you deem to be successful? RI: The mHealth industry is one of the fastest growing in healthcare. I was really very proud that it moved so fast. I was just looking at the web and I realised that there are, for example, 13,000 consumer health applications available on Apple iTune stores in 2012. However, this advance in mHealth is causing a lot of people to think that mHealth is just another app, which is of course completely false. It has to be clearly understood that actually it’s a whole domain of how the future of ICT for healthcare is moving from e-health to mHealth, and it’s not just another app solution, or a number of app solutions. mHealth is very broad. For example I am currently focusing on social networking for mHealth applications and their role in improving disease management. The other area that I am focusing on is the role of health information centric networks, and also looking at LTE and 4G generation of telecommunication for real-time diagnostics. Another new area where I am working on is the role of social mobile robotics for future mHealth services. This is bringing a new domain of companion robotics, psychology and social research into the mHealth domain. RA: Looking ahead what do you think mHealth will look like in 10 years’ time? RI: I would like to see mHealth play a major role in redefining what health is and how health is related to issues around wellbeing and disease management and how medical care will be practiced in the future. This is where I can see mHealth moving. Future technology and patient and consumer acceptance will play a major role in prevention and wellbeing so that we can actually reverse a lot of diseases by using these technologies in the future. In 10 years’ time there will be a lot of integration between genomics and environment within the mHealth domain. People will probably be aware of how the environment, based on their genomics and genetic profiling, will impact their personal potential of having any future diseases. This is genomically enabled digital health. This is a very controversial area but I think that’s where research will be moving in the next 10 years. RA: Professor Istepanian, thank you very much your time. RI: Thank you very much Rebecca. Robert S. H. Istepanian is Professor of Data Communications at Kingston University London and a visiting Professor in the Division of Cellular and Molecular Medicine at St. George’s University of London. He is the founder and director of Kingston University’s Medical Information and Network Technologies Research Centre (MINT). He completed his studies and obtained his PhD from the Electronic and Electrical Engineering Department at Loughborough University in 1994. Since then he has held several academic and research posts in the UK and Canada, including senior lectureships at Portsmouth and Brunel Universities in the UK . He has also served as an associate Professor at Ryerson University in Toronto and adjunct Professor at the University of West Ontario in Canada. He was the 2008 Leverhulme distinguished visiting fellow at the Centre for Global e-health Innovation, University of Toronto and the University’s Health Network, Canada. Professor Istepanian served on the editorial board of several IEEE Transactions and international journals’ editorial boards, including IEEE Transaction on Information Technology in Biomedicine (since 1997), IEEE Transactions on NanoBioScience and IEEE Transactions on Mobile Computing, the International Journal of Telemedicine and Applications and Journal of Mobile Multimedia. He has also served as guest editor of several special issues of the IEEE Transactions including IEEE Transactions on Information Technology in Biomedicine (on seamless mobility for healthcare and mHealth systems, 2004) and the IEEE Transactions of NanoBioScience (on Microarray Image Processing, 2004) His extensive funding portfolio include leading projects in the areas of mobile and wireless healthcare funded by different research funding bodies in UK and abroad. He was also key speaker and expert advisor on numerous evaluation and expert panels in areas of mobile healthcare in UK, Canada, Holland and Finland. He has published more than 180-refereed journal and conference papers and edited three books including chapters in the areas of mobile communications for healthcare, mHealth technologies and biomedical signals processing. 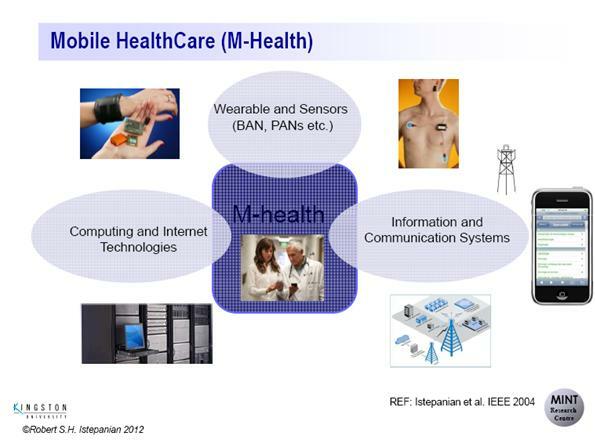 Hi is currently finishing a book on mHealth Principles and Applications to be published by IEEE- Wiley in 2013. Robert will be working with the journal World Medical &amp, Health Policy to edit an upcoming special issue on Mobile Pharma and m-health technologies’.